The world of food allergies and dietary restrictions can be a dark and lifeless place. If any of you has ever tasted gluten-free pita bread, you know what I’m talking about. Everything is either bland, squeaky, or so full of ingredients you wouldn’t even attempt to pronounce that having these food limitations can seem like a death sentence. A girl cannot survive on broccoli and chocolate bars alone. This is when having no problem poking around the kitchen for hours comes in handy. I’ve attempted a few gluten-free cookies that have come out tasty, but a little lacking on the texture front. It’s so difficult to get that balance between crunchy and chewy when you’re not using regular flour. And don’t even get me started on trying to make bread. But what I want to know is why try to mimic something else, when you could make something special and uniquely delicious in its own right? And that’s why I like almond flour. 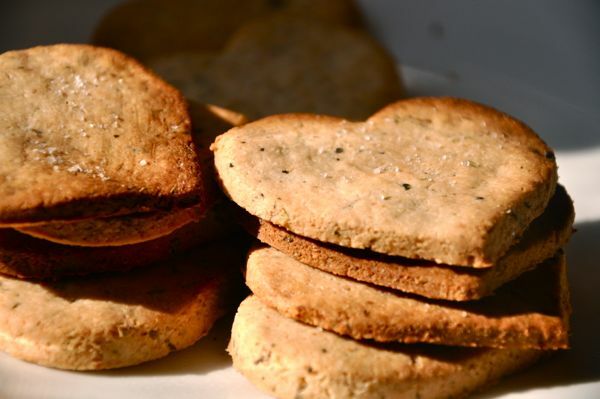 Crackers are an easy foray into gluten-free baking. They are nearly impossible to mess up, and they come out tasty and exactly the way you’ve imagined them. They also use so few ingredients that it’s hard to believe they’ll work when you’re whipping up the dough. Make a batch or two, freeze one, and you’ll always have a munchable snack at the ready for when those carb cravings kick in. Whisk together almond flour, Herbes de Provence, and salt. Stir in water. Gather dough into a ball and press between two pieces of plastic wrap until flat and 1/8 to 1/4-inch thick, depending upon how thin you like your crackers. Cut into shapes until all dough has been used. Place on an ungreased baking sheet and bake for 15-20 minutes, until golden brown and firm to the touch. Let cool. Thanks for this recipe! When I first discovered that I was gluten intolerant, I went into culture shock — bread being one of my favorite things in the universe. But now I realize that it has opened up a whole new world of tasty treats yet to be discovered! Thanks for sharing. Would it be a problem if I added a small drizzle of extra virgin olive oil?